So you’ve heard about Blender, the free 3D animation software. You really want to know more about the features of Blender, where to get it, and how to use it. You’re in luck! 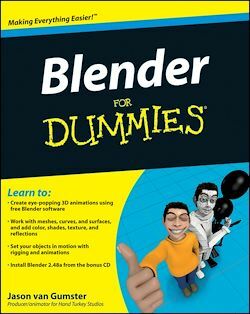 It’s all in Blender For Dummies, including Blender software on the bonus DVD. You’ll even get tips on common problems new Blender users face and how to avoid them. Blender For Dummies will have you creating eye-popping 3D animations before you know it!